More today on the origins of my monoprint series “Natural History”. Some years ago, I came across an interesting historical factoid. I wrote it down. Soon there after I read an article about Pliny the elder, an ancient Roman historian, who wrote the world’s first encyclopedia, “Historia Naturalis”. See where this is going? I started to collect other bits of odd history and general facts I found intriguing. Things people probably knew nothing about. One day it occurred to me that I was on to something. I made the first 10 of the monoprints, entered some in a national competion, was accepted to the show, and had one print purchased for their permanent museum collection. I took that as a sign from above. I’m all about omens and portents. Tomorrow: more about Pliny and the underlying thesis of this project. There has to be a “Why?” I won’t make art without it. Today’s Monoprint: “Natural History: Dollar Bill”. Aquatint, hard ground etching, chine colle,linocut,trace transfer monotype. Dollar Bill. 1/1. Contact me-It’s for sale! I promised I would start giving you an explanation for the subject matter of my monoprint series,”Natural History”. I love history. I think it is important. Doomed to repeat and all that. Context for every part of life. You know, history. I detest what I find to be a more and more common attitude among younger people, ( uh oh, dangerous territory here! ) to explain away ignorance by simply stating, “that happened before I was born”. Okay. I can’t control that seeming pride in being uneducated, clueless, and oblivious to the world. I can have fun with my target audience, however. Intrigued? Next post: The History of Everything. With an introduction to the world’s first encyclopedia, “Historia Naturalis”, and Pliny the Elder. Trust me on this! “Natural History: Church and State”. Ponder the implications of that…. That hasn’t changed much. I wanted to share my artwork. Primarily, my ongoing monoprint etching series, “Natural History”. There are over 100 prints in the series, and I thought that was plenty of fodder! With some entertainment value. Along the way, I will be delighted to answer questions about technique and subject matter, philosophy, history, recipes, and my continuingly baffling personal life. With the Memorial Day weekend about to begin, le us think about those who have served and sacrificed for this country. Eternal Vigilance. Eternal Gratitude. Image size=12″x 18″. Framed 24″x 30. Printed on Rives BFK white archival paper. Edition 1/1. To begin, each print background consists of 2, different colored, inked, aquatinted copper plates printed over each other. This produces the variegated stripes. More later about the inspiration for this series. Starting over-Please share this post! This print can be purchased through my Etsy site. Contact me through comments on the blog. Well,- I don’t know what happened here on the blog site, but finally got the monoprint jpg in!!! A humorous and Factual? text? 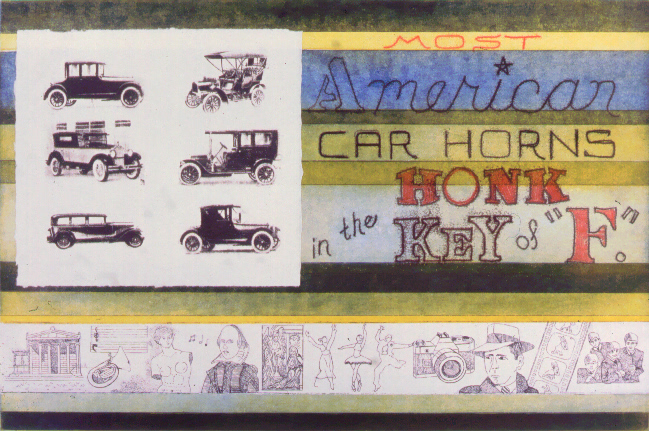 Cars are created from a pronto plate plastic litho-then applied as a chine colle. 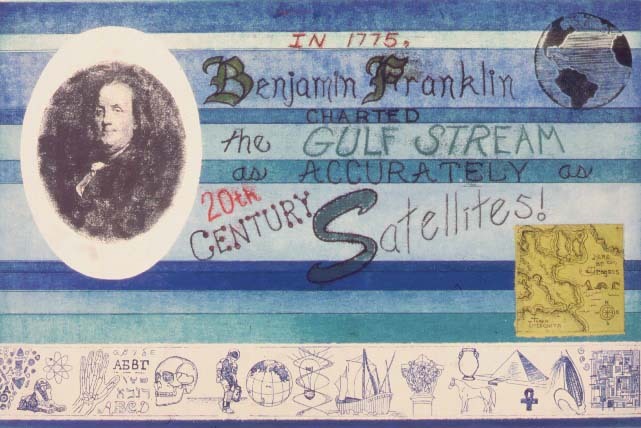 Etching strip at bottom, with aquatint background and trace transfer text- Hand designed font. For your amusement- And for sale , if you wish! Contact me! I sell through etsy. Follow me! Like me! Glad to be even a little better-will address that later. A mid-series monoprint, and one of my favorites. I was now printing the smaller etching plates onto archival papers-building a library of images that I could add onto the prints by chine collé. The portrait of Ben is a transfer technique-directly done onto the background paper. I used and oval mylar mask when printing the background stripes to create the blank area. A little bit of real Natural History for the day! Please ask me questions about any of the techniques I named in this post. Realize it is very techie printer! History? Factual? Incendiary? 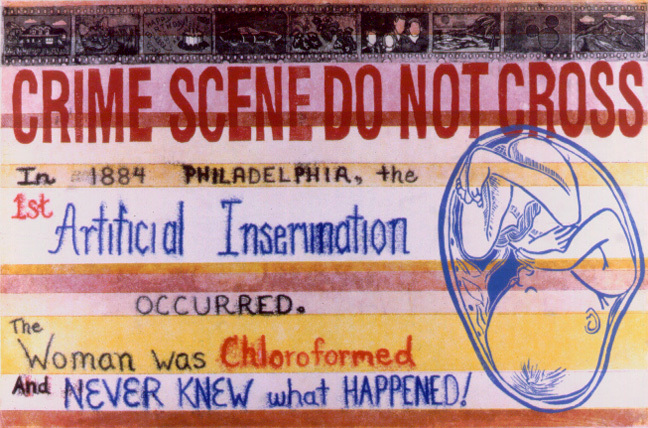 This is an earlier print-uses my favorite fetus linocut. Never knew how useful this plate was going to be. Many of these monoprints deal with feminist issues. Not a big surprise. Real History. This print combines several etching plates, printed over 2 aquatint plates. 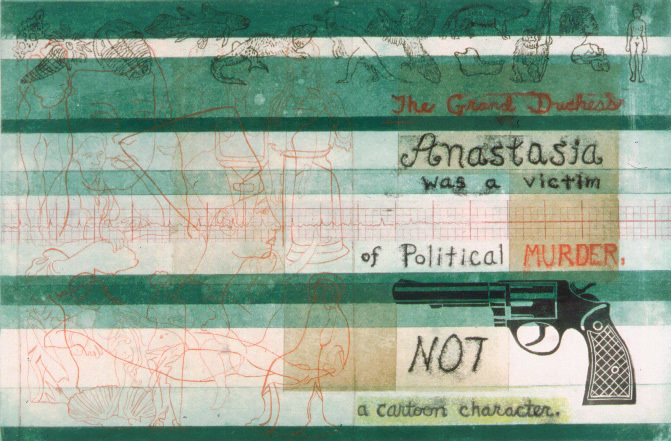 The gun is a linocut. Text was hand designed and printed via trace transfer monotyping. I will post more on this technique later. A very expressive and fast way to make beautifully textured lines-akin to a drypoint. An early print in the series. In reference to the 20th Century Fox cartoon release of 1997. I found the movie version with Ingrid Bergman less offensive, somehow.